Intellectualizing a bizarre premise or storytelling strategy is one thing but seeing it come to life is something different altogether as moviegoers around the globe witnessed back in 2001 via Christopher Nolan’s breakthrough sophomore effort Memento , which ambitiously forced us to see the events unfold onscreen in reverse through the fractured mindscape of its short-term memory challenged unreliable narrator. And indeed most of us knew going into the movie precisely the type of structure that Nolan was planning to use since the novelty of Memento ’s approach was more than half the fun to see if, and just like The Blair Witch Project or other daring indies – the works could transcend the idea of a simple gimmick or onscreen stunt by getting us lost in the plot rather than the technique. However, as mind-bending as it was to watch a movie flicker before our eyes mostly in reverse, Rodrigo Cortés’s Buried is a far more provocative example of what can be achieved with shared-point-of-view filmmaking by serving up an intensely visceral experience that traps the audience right along with our main character inside an enclosed wooden coffin, a few feet below the earth for its ninety-five minute running time. 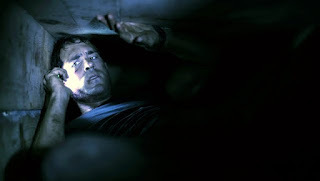 For regardless of how prepared we think we are to be buried alive alongside married father Paul Conroy (Ryan Reynolds) as he awakens in total darkness bound and gagged before discovering his fate, the reality of the situation is incredibly overwhelming once the movie begins and we’re plunged into darkness, with heightened breathing on the soundtrack and the claustrophobically tight shooting space of a real coffin. Although it evolves into a taut, intelligent thriller as Paul opts for fight instead of flight, initially Buried is so frightening that I thought it was quite possibly the first film in history that should require proof of a recently aced stress test and EKG in addition to the standard ID check for R-rated fare. For even though I was more than familiar with the premise and unfortunately a few twists in the first hour thanks to some spoiler happy colleagues, while watching Paul orientate himself in the midst of a well-deserved freak out, I thought I was going to have a heart attack myself. 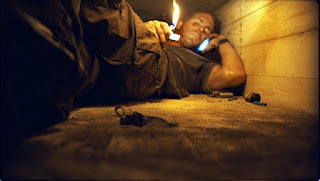 Trying to remain proactive, after removing the gag and breaking his hands free, Paul makes the most of three dwindling bars on a cell phone included in the box with him to try and coordinate a rescue despite the fact that he has no idea exactly where he’s been buried. Relying on the phone as a lifeline as he’s been told by an anonymous individual he discovers is his kidnapper that he has roughly the length of the film to raise a ransom, Paul goes into action, dialing anyone and everyone he can think of from skeptical emergency operators to the voice mail boxes of his wife and employer. 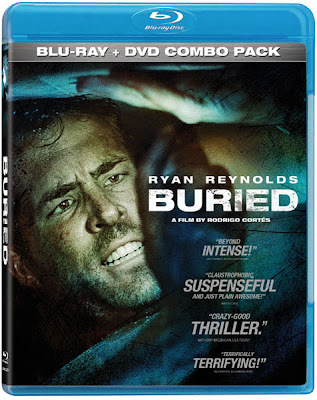 Overall, Buried is a genuinely Hitchcockian inspired thriller, since the innocent everyman Paul is Hitch’s quintessential “wrong man” who only discovers he “knew too much,” after the fact. Likewise as Reynolds notes, the Master of Suspense would definitely have wanted to film the work if it’d been written decades earlier, having never been one to shy away from experimental techniques as evidenced in Rope . Yet, it isn’t a mere copycat work of connect-the-Hitchcock-influences as writer Chris Sparling embraces Kubrickian irony as well in National Board of Review award winning screenplay, infusing Paul’s hellish plight with some darkly sardonic opportunities to satirize everything from corporate America to foreign policy and simple phone etiquette. A harrowingly intense portrait of the human condition as Paul is after all, just a man trying to survive, Buried also touches on the domino effect of violence as one action always leads to another, even in different corners of the world, making Cortés’s work particularly timely for those who wish to peel away the layers of the superb film to find the humanistic meaning in the horrific madness. Operating on a similar fear based mystery level comparable to David Fincher’s Panic Room , wherein our hero tries everything we can think of (and more) to persevere, Buried is likewise refreshingly respectful of the audience’s intellect, time, and our suspension of disbelief by never abandoning the main premise of the man in the box for third-act-miracles or new characters that arrive out of nowhere. To this end, Buried is believable to a fault in that it’s far more terrifying – at least in my eyes – than any kind of CGI vampire movie because we can relate to Paul on a human level. 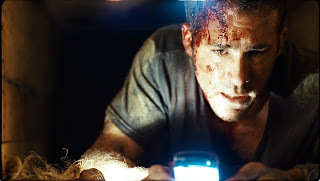 Additionally, it's a phenomenal crossover calling card for the Spanish Cortés, an impressive feat for Sparling and another reminder why it’s never a good idea to underestimate Ryan Reynolds, especially after we discover that the actor was actually in a box during the exhaustive seventeen day shoot. All in all, Buried is a cinematic feat you’ll have to see to believe… as long as you have your doctor’s permission.